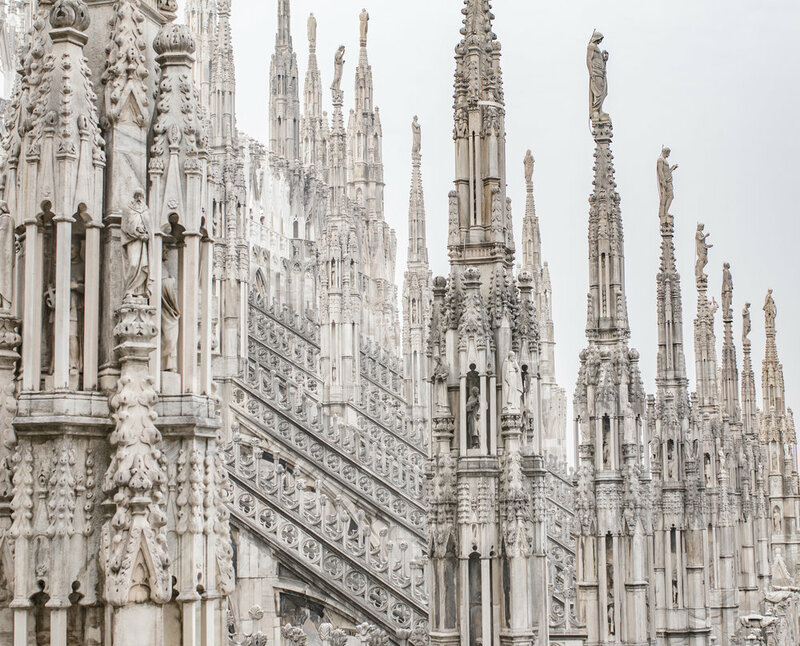 Duomo Di Milano: if you are like me and want some shots of the Duomo with barely any people without having to use photoshop then my biggest recommendation is to GO EARLY. If you can go for sunrise, that’s probably even better but if you can’t make it that early then at least try going for around 8am. 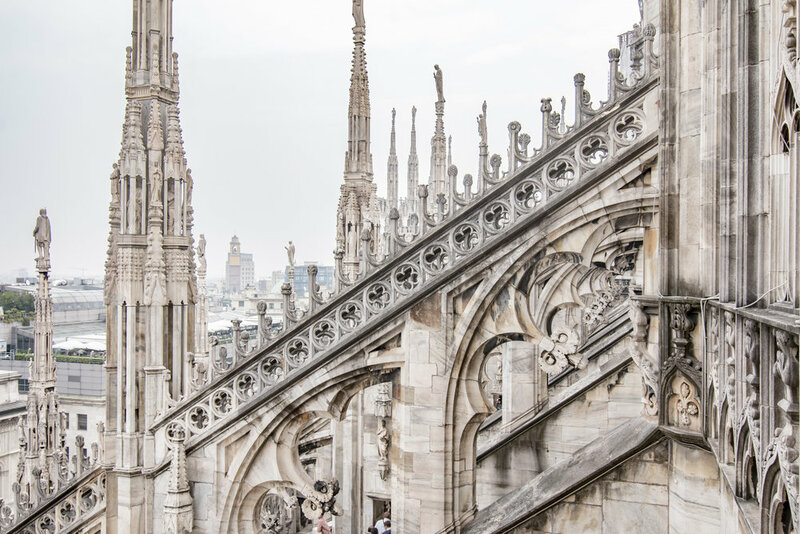 If you want to go inside the Duomo and also up to the terrace, make sure to buy tickets in advance. Even though you still need to go to the ticketing office to pick up your already purchased tickets, that line is significantly shorter than the actual purchase line. This will save you A LOT of time! Also, make sure to get the lift tickets to go all the way up to the terrace, there are lots of people using the tiny winding spiral staircase going up AND down, it’s easier to go up with the lift and then down with the stairs. 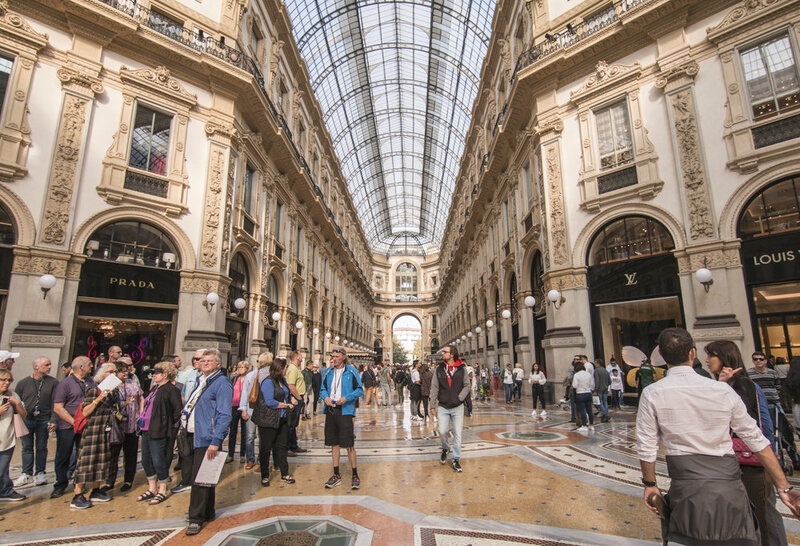 Galleria Vittorio Emanuele II: To be completely honest, I only spent about half hour walking around this place - not because I didn’t want to, but because i went at the worst possible time: in the middle of the day. With SO many people walking through, it’s hard to take it in or even look through the stores. But it was pretty magnificent to see the intricate architecture and ceilings. I’m sure if I had more time in Milan, I would’ve returned here earlier in the morning to walk through and take some more pictures. Terrazza Aperol: This is the restaurant/bar overlooking the Duomo, and honestly the perfect place to enjoy a drink. My recommendation here, if you aren’t really interested in the food and like me only want to go for a drink with a side of an amazing view, then go just before the lunch hour starts. I happened to get there for 11.20am (lunch starts at 12pm) literally missing the lineups by about 10-15 minutes. As I was leaving there was a lineup all the way to the next floor. Key here is to avoid the lunch hour traffic. 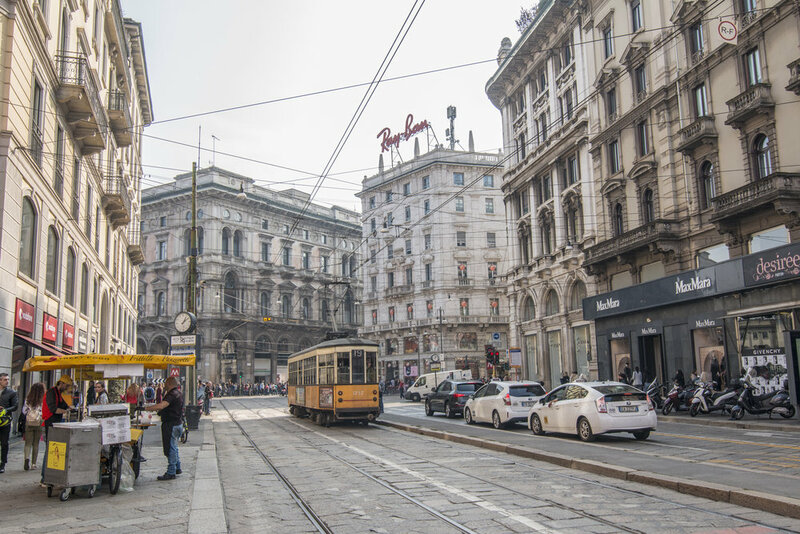 Arco Della Pace: From the duomo, you can make your way to Arco della pace, enjoying all the street hustle and bustle on the way as well as passage through a fort. You also have to walk through a park, so all in all about a 20-25 minute walk - but a very enjoyable one so I definitely recommend. Once you get to the arch, you’ll see several restaurants nearby, grab some gelato and just do as the locals do- sit and relax! Navigli Canal: The night life here with all the outdoor restaurants and patios is supposed to be amazing, sadly I didn’t make it for that but I did walk through during the day - it’s honestly a great spot to grab some breakfast/coffee and walk around. 10 Corso Como: Feel like having some brunch/lunch? Head over to 10 Corso Como, and I promise you, you’ll have never felt so outdoors while being so indoors! Its true, you’ll even have birds flying around and eyeing your food - but not to worry, they are totally harmless and only come by if you have your bread idling around! The food was so delicious, although a little on the pricey side. Still, I would recommend at least heading here for a coffee! Lake Como: If you happen to have an extra half day lying around somewhere ;) I recommend taking the train for half hour to Lake Como- St. Giovanni. It’s the perfect place by the water, to walk around, have some gelato and even maybe stay for dinner. I fell in love with the narrow streets, local shops and the mesmerizing view of Lake Como with the mountain backdrop. Oh and best of all? My friend and I grabbed some pastries on our way to the train station and enjoyed them while on board! It makes the train ride all the more enjoyable! ;) If I was staying for a little longer, I would’ve probably spent more time here and made my way to Bellagio and Varenna. Lastly- PASTA! because you can’t go all the way to Italy and not have some delicious pasta!! I went to a restaurant called Miscusi in Milan and had the Cacio & Pepe pasta - oh my lord, it was HEAVEN! I highly recommend going here and trying this house dish! But make sure to call ahead because they get VERY busy!! And that’s it folks - 2 full days in Milano with lots of walking, sightseeing and eating! I had an incredible time even though it was a pretty quick trip! Cannot wait to plan out my next trip to Italy! Have you gone to the places above?! What did you think?! Would you go again? I’d love to know!